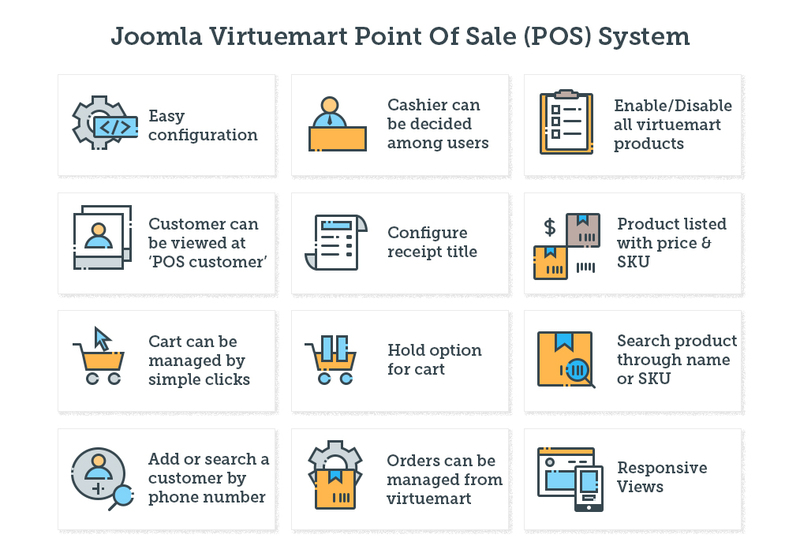 Joomla Virtuemart Point Of Sale (POS) System : Joomla Virtuemart Point Of Sale (POS) System refers to a system where the merchant can create an order from his physical store using the POS and the order will be easily generated at Virtuemart. When you have a physical store and a VirtueMart webshop you can sell your goods with your Point of Sale without giving your sales staff access to the VirtueMart backend. All products/orders/calculation rules/customers will be synchronized into the POS. In this manner, your web store inventory will be synchronized with stock at physical store. Joomla Virtuemart Point Of Sale (POS) System: Joomla Virtuemart Point Of Sale (POS) System refers to a system where the merchant can create an order from his physical store using the POS and the order will be easily generated at Virtuemart. When you have a physical store and a VirtueMart webshop you can sell your goods at your Point of Sale without giving your sales staff access to the VirtueMart backend. All products/orders/calculation rules/customers will be synchronized into the POS. In this manner, your web store inventory will be synchronized with stock at the physical store. Admin can easily integrate Joomla Virtuemart POS System into Joomla Virtuemart site. All virtuemart products are listed in "POS Products" and admin can publish/unpublish product from there. All the registered customers with POS can viewable at "POS Customers". All the virtuemart products are listed in POS view on frontend along with price and SKU on hover. The cashier can add a product to POS cart by simply click on the product and can manage quantity using increment/decrement buttons on POS cart. Option to put cart on hold is provided. A cashier can simply search for products by name/SKU. A cashier can simply search for a customer by phone number and also can add new a customer. POS orders are integrated with virtuemart and can be managed from virtuemart too. Supports Custom Fields, Cashier can choose from different available variants. Supports Barcode reader, Admin can generate Barcode of products from "POS Products" admin panel and can print barcode label. Casher can add product using barcode reader. Did you buy Joomla Virtuemart Point Of Sale (POS) System? What is Virtuemart POS System? Joomla Virtuemart Point Of Sale (POS) System refers to a system where the merchant can create an order from his physical store using the POS and the order will be easily generated at Virtuemart. When you have a physical store and a VirtueMart webshop you can sell your goods with your Point of Sale without giving your sales staff access to the VirtueMart backend. All products/orders/calculation rules/customers will be synchronized into the POS. In this manner, your web store inventory will be synchronized with stock at the physical store. Did we need to create separate products for POS? No, You do not need to create separate products. We provide products view in POS component which displays all the virtuemart products even you can publish/unpublish products from this view. Did order placed on POS will sync with Virtuemart? Yes, Orders will be sync with virtuemart and can be accessed from virtuemart orders vies. Though we also provide Orders view in POS component to manage orders. Also, admin can filter orders by POS/Vituemart orders, Cashier who place orders etc. Can we use a barcode scanner to search and add a product to POS Cart? Yes, You can use a barcode scanner to scan and add product directly to cart to save time. How will Barcodes be generated? We provide products view in POS component from where products are managed. You can generate Barcodes from this view. There are two options either you can enter barcode number or choose auto-generate option.You can then print your Barcodes if products do not have barcodes. How will POS shoppers be managed? After adding products to cart, Cashier can search for already added customers or can add new customers. Can we customize POS order receipt? As of now, admin can change the title(shop name/description). Did stock manage in virtuemart for products whose order placed using POS system? Yes, product stock will be managed for POS orders. Who can access POS System? Admin has right to make cashiers who can access POS System.There may be more than one cashiers. What about multi-variant products or products with options such as color? Multi-variant products are managed. Options icon is displayed on multi-variant products and on click of add to cart button popup containing all the option will be displayed from where the cashier can choose an option. What if a shopper wants to place an order after some time but products already added to cart? Did we need to create cart again? We provide Hold Cart option to hold the cart. The cashier can restore cart any time which saves time. How to search for a product in POS view? The cashier can search for products by name/SKU from search field or can use a barcode scanner.